My my, well done Johnny. I love them [Y] Helmut Lang has always done the best shoes/accessories. These are cool, airy. I hope they fit! Nice to see you around Johnny. Hey mate, I'm surprised that he didn't write you back. The shirt ended up costing me about $600 which I readily paid. As for CCP shoes, I got a thin rubber sole put on my pair. In the end, I don't think I could have handled seeing the leather on the bottom get scuffed and scraped up. Jo-Jo and Marco at A both highly recommended getting that done. Same goes for Carpe shoes. I've got a couple of Carpe pieces that I'm looking to part with. An off-white long sleeved paneled tee (sz. 5 I believe... fits like a DH Large) and a freeform gray hat (brand new from Maxfield's). Let me know if anyone is interested! grrrrrrrrrrrrrrrrrrrrrr. i can't believe it, i was the high bidder too and he still didn't respond after i sent him 2-3 emails. email me about your cdiem stuff. maybe you can make it up for stealing that shirt out from under me. coldrice - I sent them off today, so with any luck you won't have to wait too long. Hope they fit! 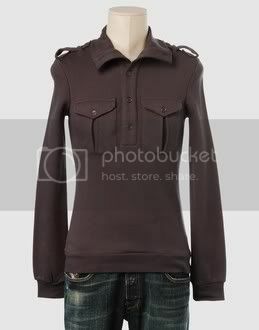 I got this Raftop (in cream, size 50) today from Yoox. Unfortunately it's too narrow across the shoulders for me, so it has returned whence it came. If anyone (a bit less boxy-shaped than I am) fancies it once it's back up on the site, it is a lovely oaty cream colour in the flesh and I definitely recommend it at the price I paid (£72). are you normally a 50? hm... would prefer the black though. I don't think we have a return fee at all over here. Haven't noticed being charged it anyway. At the Madrid sales I bought a MARNI blazer and shirt, a miu miu blazer, a dries van noten sweater and leather belt, Victor & Rolf jeans and shirt, Prada leather shoes, all of them my favourites wich I collect pieces from every season! Very contented, I didn't want to splurge so much on clothes in Europe. Nice haul! That Jas MB bag is great. Is it the one where the middle part is sort of knit? Did you mean knit? If so it's not, just plain canvas and leather combo, the other side of that bag has a side zipper. I got it at Harvey Nicks, Doors on Carnaby area didn't have it, I guess for a small shop needing storage space.